From time to time parks announce new coasters that result in me compiling updated travel plans. Sheikra (#1094) was one such ride, and it was only thanks to construction delays that my last visit missed it by two weeks. Although less than two years old the park recently closed the ride to refit it with new floorless trains, bring it on par with its recently opened brother Griffon in Busch Gardens Williamsburg. One can only really get the full effect of the floorless design in the front seat, and it was here that I chose to take all three of my circuits. The biggest positive about this coaster is also the biggest negative. In engineering such a smooth ride, the good folks at B&M have managed to design out almost all the forces one might expect from such a coaster. The turns are so wide that one feels hardly anything as they are traversed, and while this may well have been the intention the result is distinctly lacklustre. 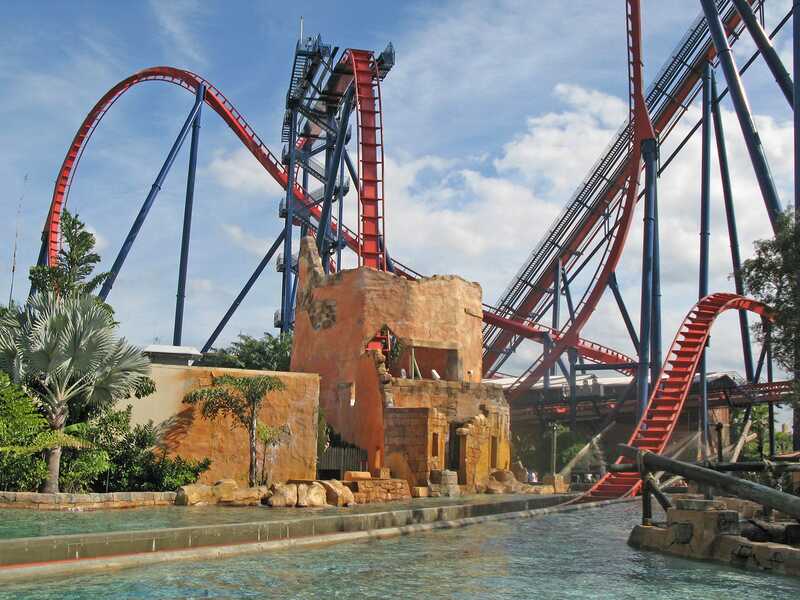 Somehow Busch Gardens Tampa has ended up with a two hundred foot coaster that for the most part feels less forceful than an average family coaster. The general public love it, though, and there is no doubt that the ride is a crowd pleaser. I just can't help but wonder what it might have been with slightly tighter turns. They could have ended up with a second Scorpion (#1095); despite being almost thirty years old this Schwarzkopf masterpiece still delivers, particularly in the helix towards the end of the ride. I was joined for my circuit by a small child riding alone who could not have been much above the minimum height requirement of 48". The lap bar, even fully closed, was still a good two inches from her body. There was no doubt she was a coaster enthusiast in the making though; the entire lap was spent with hands in the air and a wide grin on her face. On my last visit to this park, one side of Gwazi was down. The same was true today, but fortunately the open side, Tiger, was the one I'd yet to try. It proved to be an extremely wild experience, particularly in the back. As before the experience wasn't what it might have been without the two trains together, but to be fair to the park there simply wasn't the guest demand for that today; on both occasions I waited less than five minutes. This was actually the case for all the coasters bar the new one. As for the other B&M rides, Kumba has gotten pretty rough of late, while Montu has gotten noticeably faster, to the point that I was feeling slightly dizzy after one gloriously intense ride. Later in the day I ran into Marlon with a friend of his whose name escapes me as I write this. It's amazing how many people you get to know through coaster clubs. Finally, a brief note addressed to anyone from Anheuser-Busch who may be reading this. Christmas carols should not be played in November. Not even in a theme park. Thank you.